This purse is dedicated to my friend Katy and her family, the little daughter Hannah, the baby boy, Logan, and the husband Gary Fong. It is a joyful tribute to a joyful family. A special quote of George Sand, a French noblewoman of the 18th Century, very well known writer and painter, is embroidered on the front flap. 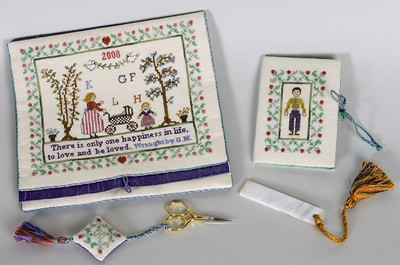 The quote “there is only one happiness in life, to love and be loved” is perfect for Katy and her family to whom this sewing purse is dedicated. 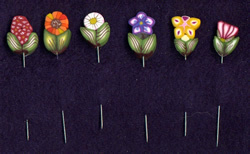 Because of the special meaning of this purse, we commissioned a lovely Flowers pins set. Accessories: Mother-of-Pearl heart rings and ruler from Kemscott Designs. FINISHING INSTRUCTIONS included in the chart pack. 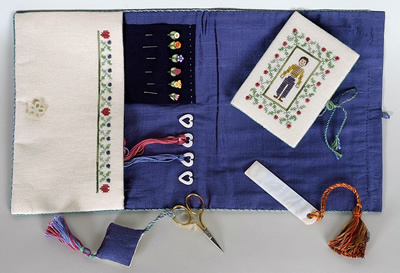 Stitches Cross stitch over two, Cross stitch over one, Back stitch, Long vertical and diagonal stitch, Smyrna Stitch over two and over four, Sofia’s Stitch, Lazy Daisy Stitch, Closed Herringbone Stitch.